The average do-it-yourselfer can build a portable chicken coop, called a chicken tractor, in one afternoon. The advantage of a chicken tractor is you can use it to fertilize your garden with chicken manure without moving it from a different location. Set the chicken tractor in the garden, put a couple of chickens inside and let nature take its course. Constructing the chicken tractor from 2-by-2-inch lumber makes it light and movable. Secure the 24-inch 2-by-2s on one end of the 48-inch 2-by-2s with the drywall screws to form an L-shape with the 24-inch piece standing upright. Secure the 36-inch 2-by-2s to the other end of the 48-inch pieces in the same manner. Place the 54-inch 2-by-2s on top of the 24 and 36-inch pieces. Secure them with the drywall screws. These are the frames for the chicken tractor. Put the four 72-inch 1-by-4s on a worktable so the wide side is facing up. Measure from one end and make marks at 23 1/4, 24 3/4, 47 1/4 and 48 3/4-inches. Put the combination square on the marks and draw lines across the wide side of the wood. Drill two 1/16-inch pilot holes between the lines and 3/4-inch from the ends. These are the runners for the chicken tractor. Stand the frames up so the 24- and 36-inch pieces are vertical. Fasten the runners to the top and bottom of the vertical pieces through the pilot holes with the 1 1/2-inch drywall screws. Attach the 24-by-36-by-1/2-inch plywood to the runners on one end of the chicken tractor with the 1-inch drywall screws. Repeat this on the opposite side with the 24-by-24-by-1/2-inch plywood. Lay the 24-by-54-by-1/2-inch plywood on top of the same end of the chicken tractor. Secure it to the runner on the 36-inch side of the frames with the piano hinge. 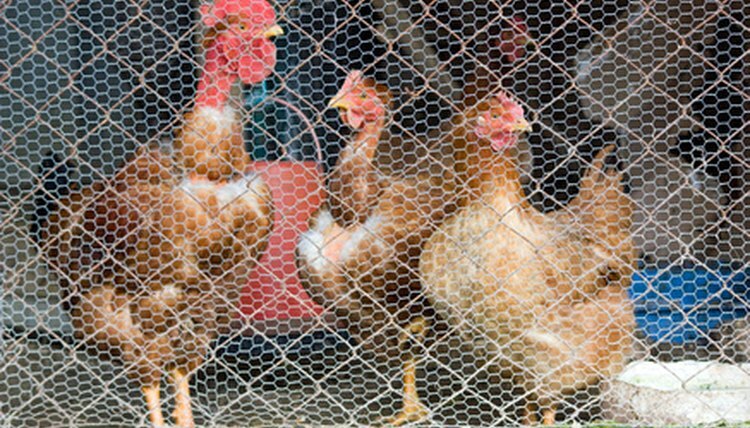 Fasten the 48-by-114-inch chicken wire to the sides and top of the chicken tractor with the 1/2-inch staples. Staple the two 36-by-48-inch pieces of chicken wire to the ends and trim off the excess with the tin snips. Drill pilot holes through the 2-by-2s for the screws if desired. Do not leave power tools within the reach of small children.